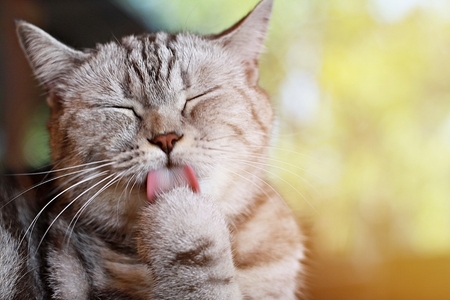 If you’ve ever received an affectionate lick from your cat during one of their grooming sessions, you probably noticed that their tongue is covered in an array of curved spines that feel rough to the touch like a strip of Velcro. It’s common knowledge that the spines on a cat’s tongue aid in the grooming process, but a recent study published by researchers at Georgia Tech is offering some fascinating new insights into the function of these curious structures. The researchers used a combination of high-speed film, CT scanning and force measurements to analyze the ways in which cats use the spines—called filiform papillae—on their tongues. As it turns out, these spines do more than just remove loose hair from a cat’s body. At the tip of each spine is a tiny hollow cavity that wicks saliva from a cat’s mouth onto their fur. As the cat grooms themself, the spines distribute the saliva along the roots of their fur, thereby cooling their skin and helping to regulate their body temperature. The spines can also help to remove debris and small parasites like fleas from the fur as well. They might not feel very comfortable when your cat drags them against your skin, but the spines on a cat’s tongue are truly remarkable tools that could prove useful in the development of new cleaning and grooming products in the future.